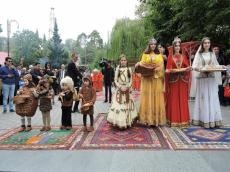 The First International Walnut, Hazelnut and Chestnut Festival has solemnly opened in a home to the largest hazelnut fields in Azerbaijan, Zagatala on September 29. The main purpose of the festival is to demonstrate the economic, cultural and tourism potential of Azerbaijan as well as Zagatala region. The opening ceremony of the event was held at the Dede Gorgud square of the region. The festival, which was organized by Zagatala Executive Power, was attended by heads and representatives of the embassies of nearly 15 foreign countries, representatives of the Ministries and state bodies, MPs, as well as walnut producers and exporters, city guests and local residents. The official guests in the festival visited the walnut garden in the area of the Zagatala experimental station and familiarized themselves with walnut processing at Azersun LLC's walnut processing plant. Residents and tourists had an opportunity to sample the year’s harvest of various types of hazelnuts, which are considered the most popular and tasty in the region. Head of Zagatala Executive Power Mubariz Ahmadzade congratulated the residents of the region on the occasion of the remarkable holiday. He noted that Zagatala is one of the fastest growing regions in the republic today. There is a great potential for hazelnut production in the region. It has been noticed that hazelnut production has become one of the traditional areas in the agricultural sector of the region since the middle of last century. The only hazelnut plant in the former Soviet Union was launched in 1929. Nuts and canned products produced in the factory were exported to all USSR republics, as well as to some European countries. In 1932 the first Soviet hazelnut farm was created in Zagatala. Ahmadzade stressed that hazelnut is currently one of the leading places in the economy of the region and it continues to work on the construction of new hazelnut gardens in recent years. Over the past three years, the total area of hazelnut groves has been increased from 9,575 hectares to 18,000 hectares. The income of Zagatala processing plants in 2016 amounted to 90 million manats ($53 million) and 124.4 million manats ($73 million) in 2017. About 13,422 tons of hazelnuts were produced in the region last year. In the current year, hazelnut production is expected to reach 15,000 tons. Currently there are more than 100 varieties of hazelnut plant in Zagatala. It was noted that in the last three years, 47.5 hectares of new walnut gardens have been laid in the region and the area of existing gardens has reached 481.5 hectares. In addition, there are 70 hectares of chestnuts in the region. Then the participants of the festival got acquainted with the exhibition of a large variety of hazelnuts. They watched the oven burning with walnut and hazelnut shells, walnut and chestnut frying, rules of storing chestnut, burning walnut branches in tendir, manufacture of horse-carts and cooking different dishes. The guests also viewed the painting and handicrafts exhibition. The winners of the walnut, hazelnut and chestnut contest were awarded in conclusion of the festival. The event was concluded with an artistic program to be held at the square in the area of the Zagatala History-Culture Reserve.